We are Deb and Ken LaVoie, the sellers. We want to give you some background on us and our operation so that you might get a better perspective on what we're offering. With real estate investing, the numbers are vitally important, of course, but knowing us a little better might inform you on how these properties have been run, how we've determined the sales prices, and what to expect from them in terms of performance and management. Ken: I moved to Central Maine from RI in 1988, and my wife Deb joined me in 2001 from Florida. We have a 16 year old daughter and we are all active in our community & church, most recently having co-chaired the campaign cabinet for 2016 for United Way of Mid Maine. 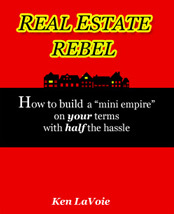 Deb and I got started in Real estate in February 2009. During the stock market downturn of 2008, our retirement accounts temporarily lost 35% of their value. We felt like we weren't at the helm of our finances. We'd always wanted to get into real estate investing but hadn't taken the leap. So we bought our first single family home in 2009 and by year four, we had our entire portfolio of 50 units. We have worked toward creating a very "hassle free" portfolio. Because we own other businesses for income, we've put much of the earnings back into the buildings, making them as trouble free as possible so that they are at their most reliable as Deb and I start to spend more time with family and other activities after our daughter graduates high school. We want an attractive portfolio to sell, but if we can't sell, we want our continued ownership to be trouble-free as well. Also, there will be times (as economic cycles wax and wane) that there will be more tenants than apartments; when that happens, we want our units to stand head and shoulders above the rest. And we promise that we do. At least 3 out of 4 prospects tell us that our units are the nicest they've seen so far. To help toward that end, we've raised our standards in tenant screening. We have high income & rental history standards and require substantial pet fees and security deposits. As of 3-15-2017 we were at 100% occupancy. Our average vacancy rate has been between 1 & 2 percent annually since 2010. Although we've had much fun, we've decided we want more time to enjoy retirement, spend time with family, and pursue my lifelong dream of being a writer and practicing musician. And so, we have decided to sell our small "empire." We recently sold our 11 unit (241-243 Main St. in Waterville) as well as a 2 unit and one single-family home. We hope you agree that our operation is a desirable one to step into. Our residents are mostly a mix of white and blue collar workers and retirees. Several of our residents have been in their apartments for more than twenty years. We have politicians, lawyers, University sports coaches, school teachers, bankers, UPS managers, hospital professionals, retired factory workers, entrepreneurs, Ivy League college professors, exchange students, social workers and more living under our roofs. A large number of our residents are employed at Thomas and Colby Colleges, nearby. Our occupancy rate averages 95%. The only reason it isn't higher is that our standards are high: We screen prospects thoroughly, and require first month's rent as well as security deposits equal to 1.5-2 months rent. If a resident has a pet, we require substantial upfront & ongoing fees. We don't normally make payment plans or deals; residents must have full move in funds without exception. Our belief is that if a person doesn't have enough saved up for security deposit and first month's rent, they aren't financially independent enough to live on their own. In addition, all units are non-smoking. Despite our "multiple hoop" system, we often have a waiting list. In exchange for our elevated demands, we offer a high level of service which we developed from our 26 plus years in the lawn & landscape service industry. The high quality of our residents makes running this portfolio of properties much easier than the typcial multi-family building. To attract the best prospects, we've worked hard to build a reputation as attentive & professional landlords. Higher quality residents seem to appreciate the higher standards because they know these standards will dictate the quality of their neighbors. Lower quality prospects just hang up (after hearing our criteria), providing us with a very efficient "first pass" screening! Nearly every unit has had some sort of makeover: some complete, others partial. Upgrades include: new appliances; wood, tile, and vinyl flooring; electrical entrances, wiring, switches, and outlets; plumbing upgrades; new paint; new vinyl replacements windows; and attics full of insulation! Almost all units are on a master key system for easy access. Nearly all units have laundry hookups or on-site coin ops. We never stop moving forward with updates and repairs. By the time you've read this page, we've probably completed something else! We also have a list of "to do's" that we're happy to share, so there's little guesswork on how much to set aside for future upgrades. Buildings are located in desirable, safe, working class neighborhoods right off I 95. Additionally, we bought a few of our buildings because they were in the "path of progress." Meaning we feel these properties could be a strategic purchase for a developer in the future. Buildings 169 & 241 & possibly 28H fall into this category. Although we have done many upgrades and raised rents regularly as appropriate, there is still room for potential income increases. Our rental rates are mostly still below fair market rents. Our general habit is to leave rents mostly unchanged during a tenant's residency, in essence rewarding those tenants for longevity. Once a tenant leaves, we reassess, make some updates, and raise the rent accordingly. Therefore, most of our units that have longer-term tenants are below market rental rates for the area.